Gestures of teacher appreciation can run the gamut from simple to elaborate, but the outcome is always the same: teachers love them. 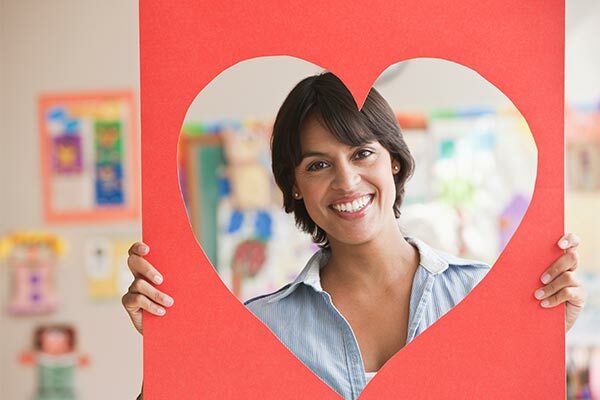 The most important part of any appreciation effort is the heartfelt sentiment behind it, so get ready to flex your celebration muscles with this list of 40 teacher appreciation themes and ideas. Spring Training - Hit a home run with this sports-themed week. Create a bulletin board with team “stats,” including fun personal facts about the staff. Give everyone some school swag like a cup or ball cap, host a baseball-themed lunch with exotic hot dog toppings and raffle off tickets to a local sporting event. Don't Stress, You're the Best! - Create a spa-like environment for teachers with little luxuries all week, such as a small candle in their mailbox, hand scrubs by the staff lounge sink and mini hand sanitizer bottles as gifts. Organize a free yoga class for staff after school and hire a masseuse for 10-minute shoulder massages during the lunch break on Friday (create an online sign up to keep it organized). Our Teachers Make Life a Picnic - Set out your red and white table cloth for a week of fun. Hold contests such as sack races and an egg toss, with prizes awarded. Set out a spread of finger sandwiches and deviled eggs for lunch, and put together a daily raffle for some donated items including lawn chairs, sun umbrellas and yard games. You Keep it Fresh - Provide staff with something fresh each day: fresh fruit, fresh flowers, a fresh round of classroom supplies, a fresh start to the morning (special coffee for the staff). End the week with a refreshing Friday — ask parents to cover recess or other duties for an extra break during the day. Real Heroes Teach - Celebrate the super power of teachers to change lives by having a snack buffet labeled "Hero Recharging Station" and a crockpot soup luncheon for "Soup-er Heroes." Create a bulletin board with students recognizing each teacher's super strength. For a fun end to the week, create capes for each teacher and get administrative approval to let the staff wear them if they wish. 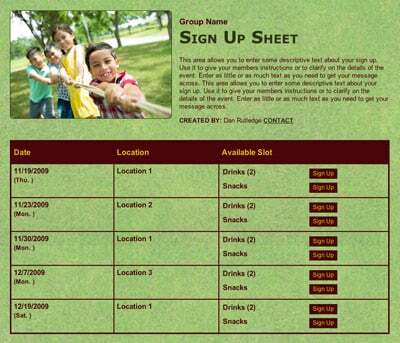 Genius Tip: Organize staff food donations with an online sign up. Bar None, You're the Best - Spoil teachers with a week of salad bar-style meals and treats in the teacher's lounge, including a taco bar, potato bar, M&M bar (include bowls of varieties of M&M candies and to-go cups), a juice bar for an after school "happy hour" and a breakfast waffle bar with lots of topping options. Grown to Greatness - Celebrate and appreciate the growth that is going on all over the school by posting baby pictures of staff and having them share life lessons they have learned. Ask families to write notes about how their student has grown under the teacher's care. Set up a farmer's market in the staff lounge where teachers can pick up free produce and participate in a raffle for gift cards to local home centers or nurseries. You Bowl Us Over - To get things rolling, give away gift certificates for free games of bowling, and host a lunch with classic bowling alley fare: hot dogs, pizza and soft pretzels are musts. Set up a mini bowling alley — a foam ball and empty water bottles work well — in the staff lounge for a little stress-relieving fun. Because You Don't Live Here - To show you also appreciate their life outside of school, encourage school families to donate local event tickets, home and car services to raffle off (ideas include a house cleaning service or oil changes). Celebrate teachers with plants for their home, a small candle in their mailbox with a kind note and a small kitchen tool or special cooking spice. While We Are on the Subject - For middle and high school, designate a subject-based theme for each day: math, science, English, social studies and specials. Put up staff pictures with messages of encouragement in the hallways, and since the staff may be spread out, gift them goodies that can be kept in their desk for quick snacks like granola bars, hot chocolate mix, microwave popcorn and bags of trail mix or crackers. We Think the World of You - Take teachers around the world with a week of cultural celebrations. You can honor your staff's heritage with a bulletin board about their cultural history (or make a world map with their country of origin labeled) and provide food from around the world for each day of the week. If you have prizes to give away, ask teachers to submit answers to country-specific trivia in a bowl, and draw for a winner at the end of the day. These are a Few of Our Favorite Things — About You! 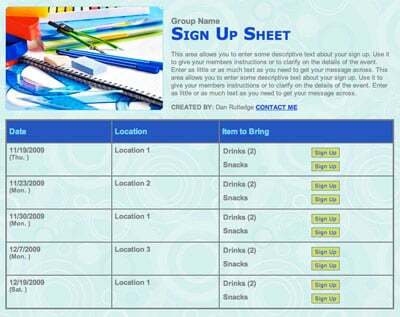 - Have room parents gather information about their classroom teacher, and each day of the week show your appreciation for your teacher's favorite things like sports team, color, snack, songs and hobbies. Our Staff is “Punderful” - You can choose one pun for each day to tickle the staff's funny bone: "We dig ____ (teacher or subject name)” attached to a potted plant; "We're Popping in to say you're great" attached to a bag of popcorn in each staff mailbox; "You're the highlight of our school" attached to a new highlighter; "We donut know what we'd do without you!" on a banner over a breakfast donuts and coffee/tea buffet; and "You're all that plus chips!" attached to a bag of chips and treats in the staff lounge. 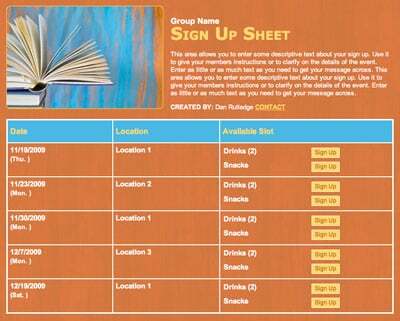 Genius Tip: Coordinate donations with a sign up! Our Staff is Such a Treat - Give a week of goodies to your staff, such as a new water cup with candy inside, special mystery treat bags in the staff lounge, coupons for a free ice cream cone or coffee at a local cafe and little luxuries like hand scrubs and hand sanitizers. Howdy Partner - Use this theme to emphasize the great partnership between parents and staff with a western-style BBQ lunch, bags of trail mix, and even a fun assembly at the end of the week with a lasso contest and student vs. staff square dance. Your Name Should Be in Lights - This star-studded week features Red Carpet Day — use red butcher paper and black crepe paper for a red carpet in the teacher's lounge. Decorate the staff lounge door with "VIP Entrance Only," and have an Oscars-style after party in the teacher's lounge with goodie bags, finger food, plastic champagne glasses filled with juice, and “Opposite of the Oscars Friday” — a casual dress day for staff (with administrative approval, of course!). Golden Ticket to Success - Celebrate how teachers are the ticket to greatness with this Wonka-themed week featuring candy bars with tickets for special prizes, a Veruca Salt Day (salty snacks), Charlie Loves Chocolate Day (lots of chocolate treats) and other Wonka-inspired silliness. Our Teachers Are Extra - Start out the week with a pack of Extra gum for all the staff and each day emphasize how teachers are extra ___ (fill in the blank). For example: Extra Organized (give each teacher a new "To Do" pad of paper) or Extra Special (a small bouquet of flowers. Have students each donate a flower). Genius Tip: Organize teacher gift baskets with an online sign up. If You Appreciate Your Teachers - Based on If You Give A Mouse A Cookie by Laura Numeroff, have each day denoted as "If You Give a Teacher a ____" and designate a daily assignment for families, such as give a compliment (have families write encouraging notes), give a snack (bring in a teacher's favorite), give a book (these can be new or gently used donations from class families), or give something simple like a smile or high-five. You Make Our World Beautiful - Go big with your teacher appreciation this year and gather donations for new furniture, pillows, paint, lamps, and even a coffee machine or artwork for the staff lounge. Do a fun mystery makeover each evening that teachers get to discover the next day or add small things each day and people who discover the change can win prizes. Genius Tip: Collect donations for a teacher gift with SignUpGenius Payments. They say the way to the heart is through the stomach, so if a whole week of celebrating isn't in the plan (or budget), even a day or two of treats can show your staff their hard work does not go unnoticed. There's No SUBstitute for Great Teachers - Provide a lunch of sub sandwiches with all the fixings. Ask parents to provide side dishes such as veggie trays, fruit, chips and dessert bars. There's Muffin Like a Great Teacher - Set up a breakfast of muffins in the staff lounge and provide cups of yogurt and special coffee and tea for your staff. Yo-gurt Our Attention - The pun game is strong with this yogurt-focused buffet to show teachers your appreciation. Provide a cooler of iced-down yogurt cups with lots of bowls and toppings for staff to enjoy either before school or for a sweet lunch treat. When It's Crunch Time, We Can Count on You - Put a bag of crunchy treats in each of the staff mailboxes with this fun tag and a note of appreciation. Holy Guacamole, Our Staff is the BEST - Crockpots of cheese dip and bags of chips make an easy nacho bar. Don't forget lots of guacamole and sour cream and one tip: If you have several lunch shifts, bring in refreshers for the later eaters so they don't walk in to find crumbs and empty containers (insert sound of crying from teacher's lounge here). We Couldn't Have Picked a Better Staff - Bowls of fresh fruit with tags like "Orange You the Best," "We are Bananas about You!" and "You are Pear'fect!" are a healthy way to show your appreciation. The Trail to Great Teaching Starts Here - M&Ms, nuts, dried fruit — these are the beginnings of greatness! Ask families to donate bags of each, and set up a buffet with to-go cups where teachers can create their own trail mix and enjoy this edible form of appreciation all day long. A Jar of Kisses - Great for an elementary class, print each child's name on a circular sticker and affix to the bottom of a chocolate kiss. Put these in a jar with a note saying, "A jar of kisses from the ones who admire you most — thank you!" Consider asking for anonymous cash or gift card donations from class families to give with the jar to sweeten the gift even more! Frozen With Love - Gather a group of volunteers and create freezer meals in aluminum trays that can be handed out to staff after school during Teacher Appreciation Week. Remember to create some vegetarian options and be sure to include cooking instructions for a treat that teachers can use immediately or keep frozen for a busy night of the week. Genius Tip: Organize a freezer meal cooking session with an online sign up. Take the Night Off - If freezer meals aren't feasible, consider handing out bags of nonperishable items to make a meal such as pasta and sauce, soup or boxed meal kits. Your teachers will get a break from meal prep for a night. If there are no school-wide teacher appreciation activities planned, consider giving your child's teacher a token of gratitude with these simple gifts ideas. Spring Survival Kit – Include desk cleaning wipes and tissues — there is not a teacher on earth who can't use more of these with the onset of allergy season! Gift Card Bouquet - Ask families to donate gift cards and put in a "bouquet" (attach cards to craft sticks) with some silk flowers for each of the teachers to enjoy. Shopping for Compliments - Fill a reusable shopping bag with index cards decorated by students on one side and with an encouraging note about the teacher on the other. Your Team is Sharp - Collect donations and buy each teaching team an electric pencil sharpener and box of pencils to get them through the end of the year (and final exams). You're the Bomb - The science teachers will get a giggle when they see this simple combination of Mentos mints and a bottle of soda in each of the staff mailboxes. Caution: May not be combined during school hours! You can also show your appreciation through simple acts of kindness that teachers will remember for years to come. Chalk it Up - Use outdoor chalk to decorate walkways around the school with messages like "Awesome staff enter here," "Come meet our amazing teachers" and "Some heroes wear capes, our heroes TEACH." Window Blessing - Gather a group of volunteers and storm the staff parking lot to clean staff car windows and put a note of encouragement and a carnation under each windshield. Clean Sweep - Offer to come in with cleaner on Friday and wipe down all the desks (include some heavy-duty cleaner for gum and tape). Ask for several parent volunteers to lighten the load and consider leaving behind some cleaning wipes and supplies as an extra thank you. Laughter is Great Medicine - Photocopy some fun cartoons with "teacher humor" to decorate the staff lounge or staff bathrooms. Put up signs that show your appreciation like, "You turn chaos into classrooms," "You do what mere mortals can't," and "Keep Clam and Proof Read." And a word to the wise: If you are going all out, don't do it alone. Asking for help is a great way to build community and get to know other school families. Use your school’s email newsletter to spread the word — and create an online sign up to make all the coordination easier. Create a teacher wish list with an online sign up. ...this application is FANTASTIC. I have 3 girls at 3 different schools and keeping up with parent teacher conferences each year has been a bear. 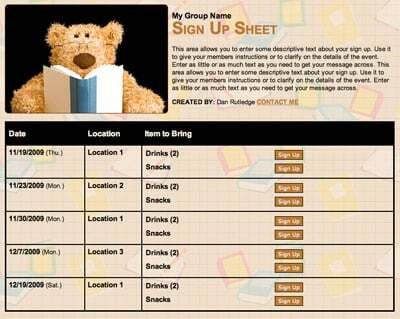 This is easy to use, provides an calendar invite option so I can see immediately if I have a conflict and I don't have to wait on the dreaded sign up sheet that is sent home.